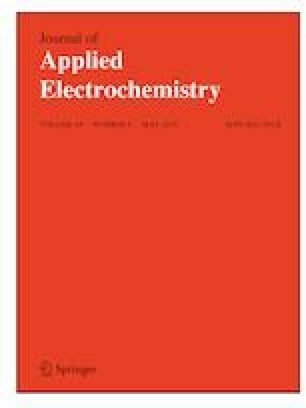 In this paper, a mediator-free scanning electrochemical microscopy (SECM) imaging concept is presented, which is capable of generating high electrochemical contrast and high spatial resolution between two conductive materials. The methodical approach is based on the hydrogen evolution reaction which shows potential dependent material selectivity. Various conductive thin films deposited on silicon substrates were studied. The investigated materials included copper, ruthenium, platinum, tantalum nitride, and titanium nitride. The hydrogen evolution was studied with chronoamperometry (Esubstrate = 1 V vs. Ag/AgCl/3 M KCl) to characterize the material selectivity of this reaction for the above-listed thin films. SECM imaging in the substrate generation-tip collection (SG/TC) mode was carried out and applied to study the boundary regions of thin copper films in combination with the aforementioned thin film materials. 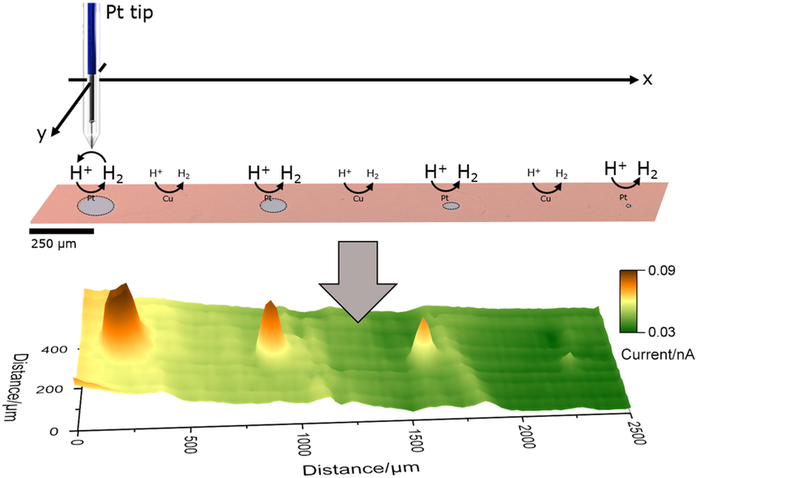 In addition, the spatial resolution of hydrogen based SG/TC SECM imaging was characterized using lithographically fabricated platinum/copper structures as test substrates. For comparison, the common feedback mode was also applied for SECM imaging of the conducting thin film combinations. It was found, that only the hydrogen based SG/TC mode enabled SECM imaging with clear material contrast between different conductive materials which was not possible in the feedback mode. Schematic illustration of imaging procedure with mediator-free SECM concept with hydrogen as active species. Timo Raith gratefully acknowledges the financial support from the Studienstiftung des deutschen Volkes.